An unknown but very interesting public water in France, is Le Barrage de la Valette. 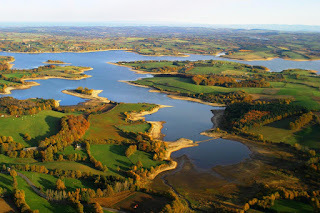 This reservoir in the middle of France is huge with 224 hectares. The average catch weight is 12 kilos. Night fishing is allowed here and anglers can visit many beautiful secluded sites to fish for carp. The reservoir of Valette is located just below the center of France in the beautiful Correze region. Le Barrage de la Valette is known mostly for its big pike and other predator fish, but also holds a good number of big carp. The 224-hectare lake is located north of the Dordogne River in the municipality of Marcillac-la-Croisille (see map below). The reservoir was formed in 1949 and is located in a very wooded area. If you are looking for a quiet and relaxed carp fishing holiday on a public water in France, this might be a good water for you. The maximum depth of Le Barrage de la Valette is 30 meters and because of the vast structure, with a length of 12 kilometers spread several very remote sites, it is a fantastic place for carp fishing. Night fishing is allowed, and the use of a boat is an absolute must to be able to fish the difficult to access sites. Boats can be put to water at three different places around the lake:the Malèze Pont, Pont de Lantourne and near Puy Nachet. The entire lake has great fishing spots. The reservoir usually reaches the highest water level in the summer and during this period, mainly because of the tourism (many bathers and people hiking around the lake) the use of backleads and and secluded fishing spots is recommended. The other seasons are much more quiet, especially without the swimming people. Le Barrage de la Valette has a nice carp file. Unique to this water is that new carp are added regularly to the reservoir, which is a rarity in France. Most of the file consists of mirror carp with a nice average catch weight of 12 kilos. Fish from 15 to 20kg are regularly caught and the absolute record is a mirror nicknamed "Lulu" which has a top weight of 30 kilos. Lulu is captured several times every year. The common carp on Valette are generally much smaller, but are also regularly caught. All carp of Le Barrage de la Valette are known for their fighting spirit and beautiful patterns. In addition, a sturgeon of 25 kilos is a resident of the lake. This great fish is captured several times every year. Night fishing is permitted, and permits can be obtained through the local administrator, in this case the FDAAPPMA de la Limousin . Below we have a Youtube video of the lake.